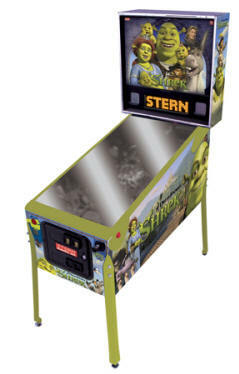 Thanks to an update to one arcade distributor’s website, we finally have an idea of what the very limited Shrek Pinball game will look like. This picture is just a prototype image, so the final game might differ slightly from what you see above. Only 250 of these are being made and to cut costs further the playfield is exactly the same as the one used in the Family Guy pinball machine but with Shrek graphics, sounds and theme applied to the dot matrix display. This particular distributor lists the price at $4475 which isn’t too bad for a game that is being made rare and currently is scheduled to reach distributors within a few weeks.